CEREC Restorations as Natural as Living Teeth! Now in just one appointment you can have a metal-free restoration as natural looking and strong as an original tooth. CEREC is a computer-controlled system that creates a tooth replacement from a single block of white, biocompatible, plaque-resistant ceramic. The effect on your smile must be seen to be believed! Not only is the restoration far more natural than old-fashioned metal fillings, it can be performed in a single appointment—in just over an hour. CEREC eliminates the need for an impression and we no longer have to have a laboratory fabricate your crown. A special computerized camera takes an image of the tooth (actually, a pin-sharp optical impression). Computer technology then helps us produce the restoration from the optical impression. You can actually watch your new tooth take shape as it’s milled by the CEREC, creating an extremely precise restoration—milling it out of a solid block of ceramic material. Finally, we bond the new restoration to your tooth using the latest techniques in adhesive dentistry. 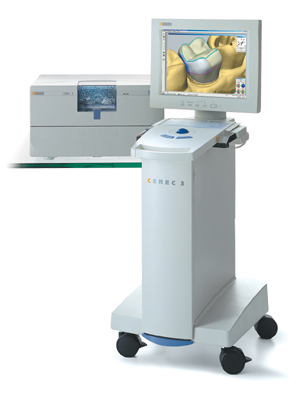 Ask us about CEREC. There’s never been a better way to restore your natural smile. The CEREC system can be used for partial and full crowns, veneers, and in all single-tooth restorations. And yes, in most instances we can replace those unsightly metal fillings with CEREC ceramic – with the same characteristics of healthy dental enamel.